Theresa played the role of the orphan and other roles for 5 years. 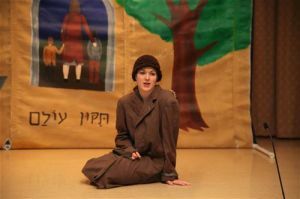 Her singing of the Hebrew song as the orphan was a huge hit with audiences. She also has played other roles in the play and will soon portray Irena Sendler, the first person other than Megan Felt to portray Irena in the play for six years.